One idea I had for a blog was one on the people here at Dickinson. One blog I really enjoyed similar to that idea was Humans Of New York because of how honest and genuine it is. It doesn’t hide any of the truth about the stories that the blogger shares. It allows people from around the world to see a bigger picture of the reality of others and allows them to relate to people in similar situations. I also really enjoy any and all blogs on baking desserts. Examples of these include You Chew, My Baking Addiction, and Sprinkle Bakes. Those are usually the ones I choose to use when finding a recipe to make. I like these blogs because they’re split up into sections to help you decide which type of dessert to make, rather than one long list. But a blog about people and a blog about food are two completely different ideas. Before I began writing this post, my first idea was to start a blog about the culture at Dickinson College. Since I am a freshman and only in my fourth week of college it seemed like a reasonable idea to learn more about the people that I will be living with for the next four years. But I realized that that would be very expected of me, and I wanted to make it slightly more unique. 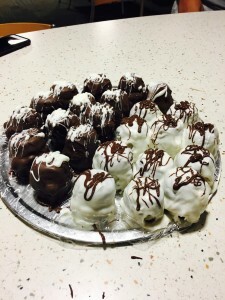 My friend and I decided to bake a dessert the other night. 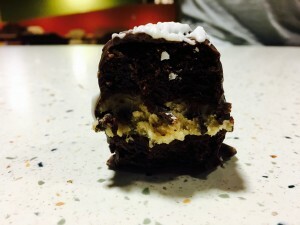 We created a brownie and cookie dough bite that looked and tasted like a heart attack. Since we had about twenty left we decided to share with everyone in Drayer. We walked in and instantly were attacked by our hungry peers. Everyone thanked us and praised our desserts. I was talking to people I had never met before, and I was learning where these people came from and desserts that they’ve made like ours at their own homes. We made cookie dough in between two brownie bites, covered in chocolate. That’s when I got the idea to combine baking with learning about the culture. My blog will be about the desserts that I make with my friend and then how sharing it brings us closer to our peers. Hopefully it will allow me to make new friends and for others to do the same.